Álvaro Arbeloa said goodbye to all Real Madrid fans last Sunday at Bernabéu stadium. The defender played the second half and could say goodbye on the ground to the club after playing seven season in a row for Los Blancos. The club wanted to thank the madridista with an emotional video resuming the farewell party at Bernabeu. 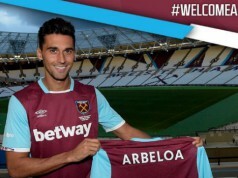 Arbeloa arrived to the club in 2009 from Liverpool, where he played for three hole seasons. However, he played as a youngster for Real Madrid before leaving to play for Deportivo de la Coruña. In his career, Arbeloa won the World Cup and two European Championships with Spain, one Champions League, one Liga BBVA and two Copa del Rey among other major trophies. The defender had the party he deserved on the pitch.